The two GOP leaders in the Illinois legislature reversed course and met with House Speaker Mike Madigan and Senate President John Cullerton Sunday afternoon, but acheived no meaningful breakthroughs as the deadline to end the state's budget impasse rapidly approaches. 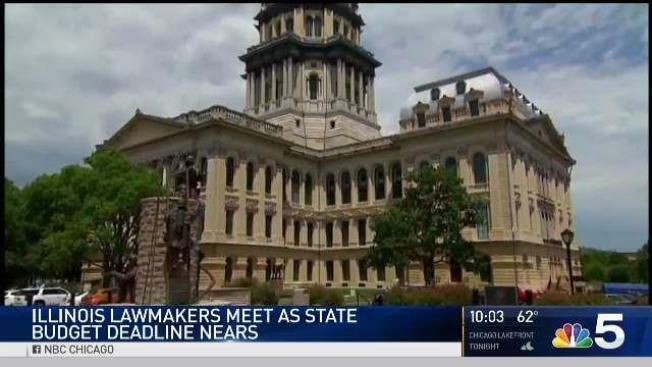 Senate Minority Leader Christine Radogno and House Minority Leader Jim Durkin met with the Democratic leaders at 1:30 p.m. for the first time in several months to discuss the nearly two-yearlong deadlock. During the meeting, Madigan said that he supported the idea of a property tax freeze, a proposal pushed by Republican Governor Bruce Rauner, but brought up three requests that he would make in budget negotiations if lawmakers agree to that plan. Those demands include changing the school funding formula, regulating rates on worker's compensation insurance, and making the process of procuring healthcare contracts in the state more transparent. "I told Republican leaders in the House that we are working on a bill that would freeze real estate taxes," Madigan told reporters. "However, that's where we add three additional items to the list." After the meeting, Cullerton told reporters that there was a sense of urgency in the negotiations, but that Sunday's events should "fuel new optimism" that a deal could happen soon. When asked if the people of Illinois should be more or less optimistic after the leadership meeting, Cullerton said more "because we couldn’t even get a meeting a couple days ago." Despite Cullerton's optimism, the Republican leaders left the closed-door event saying they wanted to see Madigan's budget proposal before meeting again - though Madigan said he hoped to schedule another summit on Tuesday. "I don't know what's the point of meeting unless we actually see what they have to produce," Durkin said. "We can go in there and we can talk in circles, but I'd like to see what exactly they're going to produce. We have five days left. They need to produce their plan." Rauner was not in attendance at Sunday's meeting, which took place on the fifth day of the special session in Springfield, though he met with Radogno and Durkin before the four tops gathered. The meeting was the first with all four leaders in more than six months, since negotiations - that included Rauner at the time - broke down in December. Both Republican leaders refused to meet with the Democrats on Friday, saying that they were deferring to Durkin’s one-on-one discussions with Madigan. There has been at least one private meeting between the two - but none reported since Thursday. Traditionally, it takes all four leaders and the governor to strike a deal. "I think we’ve got time, but I think I need to be able to work with him to see how far we can get," Durkin said Friday. "Having four of us in the room is not going to solve anything right now." "Speaker and the leader can sit in private and negotiate and try to make some progress," Rauner echoed, adding, "I think that’s been the focus that Leader Durkin is emphasizing and I support him in that." The state’s nearly two-yearlong budget impasse sits in the House, as the Senate has agreed to the so-called "Grand Bargain" budget compromise. Lawmakers have until the end of the month to reach an agreement, or the new fiscal year will begin without a budget in place. If that happens, credit ratings agencies have said they will downgrade Illinois’ rating to "junk” status, road work across the state will come to halt, some lottery games will no longer be sold and thousands will be left unable to work. Already, social service agencies have been waiting for more than two years to be paid. A patchwork of court orders dictates that the state pay certain suppliers, though Illinois Comptroller Susana Mendoza has warned that her office is required to pay out more than it receives in revenue each month. Illinois already has a $15 billion backlog of overdue bills and the lowest credit rating of any state. Sunday’s closed door meeting could be the start of lengthy negotiations, with the June 30 deadline just five days away.